My friends are a bunch of clowns. My blogging, virtual friends, that is. My blog roll was getting to be longer than the face of a last-place race horse, taking up too much space on the right sidebar. So I decided to create a separate page for my favourite bloggers. Why clowns? Because they are - in a good way. I've long been fascinated by clowns, going back to Charlie Chaplin's The Tramp, Emmet Kelly, Red Skelton, Howdy Doody's Clarabell (pictured above) and even Crusty from the Simpsons. And I grew up as a kid watching Kiddo the Clown as a tyke in Toronto. 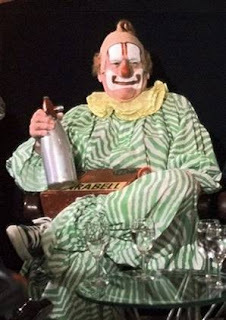 So to refer to my blogging buddies as clowns is appropriate and complimentary. On Bunch of Clowns, accessible by clicking on the clown picture in the right side bar, you'll be able to access all my favourites and there's a direct link to HumorBloggersDotCom, the mother house of all that's funny on the interwebz. In keeping with the a "circus" theme, I've called the HBDC links The Big Top. A Little Song A Little Dance groups the blogs I visit, if not daily, several times a week. These guys are the creme de la creme of humour bloggers, and always make me laugh. You've probably seen many of their names around because they also include my top commenters. A Little Seltzer Down Your Pants lists the blogs I try to visit on a regular basis, but probably less frequently than the others. Hey, a guy can only do so much! Some times real life gets in the way, you know! I guess you could call these guys the creme de la rest of them. Take a walk through my links and visit some of these folks. They're funny people. You won't be disappointed. BTW, A Little Song A Little Dance A Little Seltzer Down Your Pants was the philosophy of the fictional Chuckles the Clown from the Mary Tyler Moore show and the episode "Chuckles Bites the Dust", often referred to as the funniest half-hour on television. And drop back to see who's new. The list expands every now and then. This past week. for example, I added 3 very funny blogs: Writes Phillipia, Wasted Space and Soggy Doggy Bloggy. Two cannibals were eating a clown when one turns to the other and says, "Does this taste funny to you?" Hey! Today's the last day to enter the caption contest. Winner announced tomorrow. Thanks for the lists of funny people... I look forward to making my blog list longer! 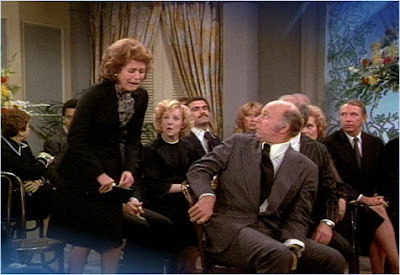 Thanks for including me on your blogroll and as for the Mary Tyler Moore episode, it is one of my favorites. Thanks for reminding me of it. I remember Chuckles the Clown. Not so much the episode itself (though I'm old enough) but the fact it's considered a classic. CatLady: You won't be disappointed. There's something in there for everyone! Unfinished Rambler: No prob. You're right up there. Canadian Blend: I don't think I saw that "Jim" episode although I used to watch the show regularly. Funny thing - critics hated that show but viewers seemed to love it. That's a really cool idea for a blogroll! Nicely done. I'll go check out your lists shortly. Clowns huh? They always weird me out. Although Willard Scott as Clarabell (before Ronald McD) and Red Skelton were two funny ones to me. ThinkinFyou: Yeah it adds a little fun to keeping track of my faves. Don: Willard Scott was still a clown when he did the Today Show weather. dizzblnd: Hey, no problem. I thought all of my 3 readers should know about you! There are three funny clowns: Flunky the Clown, Homey the Clown and Red Skelton. As far as your clown list goes, I'm not going to look at it, because I'm never on anybody's clown list and it makes me sad. And there's nothing scarier than a sad clown. Especially if he's armed. Even more so if he knows where you live, nonamedufus! Just kidding. No, you're not. Yes, I am, I am kidding! Shut up! No, you shut up, I like nonamedufus! Man, clowns freak me out. Does that now mean that I freak myself out? John: Aw, quit clowning around.